A couple of Italian White wines from the Marchesi Antinori stable of producers, fresh, elegant and perfect for lazy summer evenings ..
Bramito is the second wine of the now famous and sort after Cervaro produced by Castello della Sala in the heart of Umbria, made with 100% Chardonnay. Pietrabianca is from Puglia in the boot of Italy and made by Tormaresca at the famous Castel del Monte, in an area probably more famous for Primitivo but is a region fast gaining a reputation for producing high quality and great value wines. As a special offer to FWFA the agent has released a small number number of rare magnums of Pietrabianco, not available with any other UK Merchant. Both wines are immediately available, direct from the UK agent and at the best UK prices. 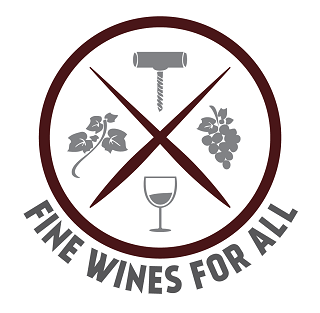 I was recently asked 'why we were promoting so many wines from Italy?' and the answer was rather simple. in my opinion they have had an incredible run of successful vintages (hardly a bad one since 2004) and frankly, they are making high quality wines at excellent prices across the spectrum. This elegant Chardonnay is produced on the Bocca di Lupo estate in The Murgia region of Apulia. The distinctive characteristic of this area is its “pietra”. The etymology of the word “Murgia” refers sharp stone or rock and makes a specific reference to the dry stonewalls that line the countryside. ""Pietrabianca"" also refers to the stones that rural farmers hit while ploughing the fields and once they were crushed and ground into the soil, helped enhance the flavors of the wines grown there. Rich, complex and at the same time fresh and pleasant, Pietrabianca shows that Apulia is a region of great white wines too. Aroma: a rich and ample bouquet with notes of citrus fruit flowers, broom, sweet spices, and vanilla. Flavor: a full, balanced, and persistent wine, whose savory and mineral notes combine with the sweet and elegant sensations of ripe fruit. "Aromas of citrus, sea spray and toast ride over a riper core of melon on the nose. This is expressive in fruit intensity and weight, offering a silken palate of juicy melon and citrus flavors, balanced by an integrated vein of acidity. A lightly charred lemon note lingers on the finish." The first vintage of Bramito to be produced was the 1994. The Castello della Sala estate, purchased by the Antinori family in 1940, is located approximately 10 miles (18 kilometers) from the city of Orvieto. The castle is a typical example of medieval military architecture and its micro-climate, generally rather cool, is an ideal one for the production of white wines and Pinot Noir. "The 2017 Bramìto shows a straw yellow color. The nose is characterized by delicate white flower notes followed by light sensations of citrus fruit. The palate is crisp and with a good body, vigorous, and with pleasurable mineral notes which make the finish and aftertaste enjoyably savory." "The Bramìto della Sala is a lovely and expressive white wine with a food-friendly and informal approach." 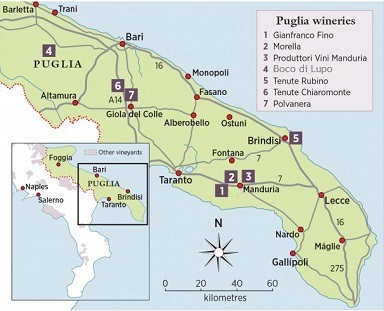 "Antinori’s purchase of two properties in Puglia a few years ago marked the beginning of a period of investment in Puglia that continues today. Puglia remains one of the most fascinating regions in Italy for its rich history and as yet fully unrealized oenological potential. 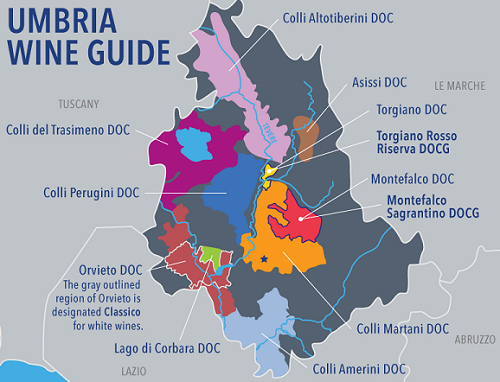 One of two entry-level wines from Tormaresca are solid values. " Exclusively confined to the township of Castagneto Carducci, 96 kilometers (60 miles) to the southwest of the city of Florence on the Etruscan coast of the upper Maremma, an area lodged between the historic hamlet of Bolgheri and the old Via Aurelia road with the sea to the west and the hills which close in the zone to the east. Bolgheri, as a zone, represents the primacy of modern Tuscan oenology in a unique, high potentialterroir which joins the fragrance of the sea and Mediterranean brush to a fascinating local history and the poetry of Carducci. Here such French grape varieties as Cabernet Sauvignon, Cabernet Franc, Merlot, and Syrah have found their maximum expression, particularly in typical Bordeaux blends. But this is also a high level spot for an important native white variety, Vermentino. The result is, systematically, wines of great aromatic character, complex, generous, unmistakable, which express – above and beyond their grapes or blend – the territory.